BOMA’s Rural Entrepreneur Access Project (REAP) enrolls women in a two-year program that gives them the tools and resources they need to start a small business, earn a sustainable income, accumulate savings and graduate from extreme poverty. 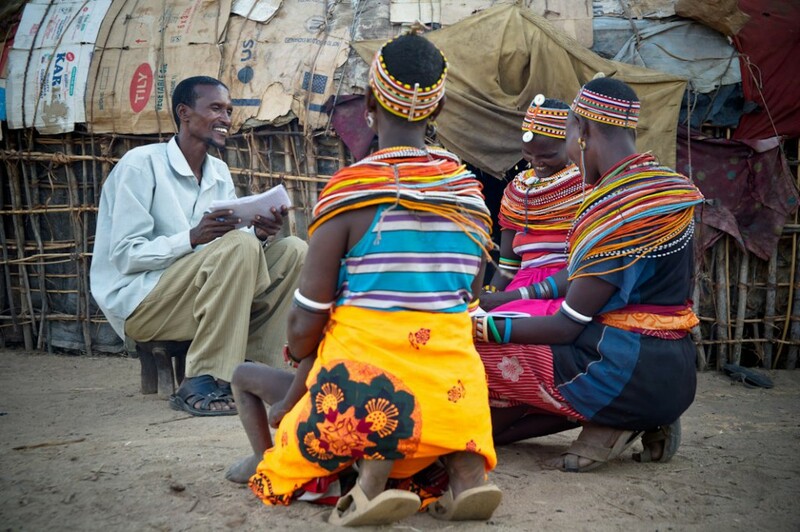 Here, a BOMA Village Mentor works with program participants to help them to write a business plan. The BOMA Project, a Vermont-based nonprofit that helps poor women start small, sustainable businesses in their rural villages in Northern Kenya, is marking an important milestone as its signature program enters its fifth year of improving lives for generations to come in sub-Saharan Africa. In 2008, BOMA initiated the Rural Entrepreneur Access Project (REAP), which has since lifted 23,000 women and children out of extreme poverty. REAP is an innovative poverty-graduation program that offers business-skills training, a start-up grant and two years of mentoring to small business groups of three women. In 2011, BOMA added a micro-savings component that teaches participants the importance of savings, facilitates access to secure savings instruments (such as three-lock boxes and mobile banking, where available), and helps REAP business groups to establish mentored savings and loans associations. The numbers, as REAP enters its fifth year, are impressive: BOMA has launched 1,145 income-generating businesses in 20 settled villages and more than 250 nomadic villages across Northern Kenya. These business groups comprise 3,963 adults, who use the income and savings to support more than 19,800 children. This total includes 177 savings groups, each made up of between three to eight REAP business groups. Guided by an established constitution and lending guidelines, the savings groups offer interest-bearing loans to REAP participants and trusted community members, often serving as the first—and only—source of cash and credit in these remote villages. The BOMA Project is a U.S. nonprofit and registered Kenyan NGO with a proven track record, measurable results and a transformative approach to alleviating poverty, empowering women and building resiliency in the arid lands of rural Africa. For more information on The BOMA Project, go to www.bomaproject.org or call 802.231.2542.